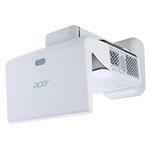 The Education series projectors are great for both small rooms and classrooms. Positioning the projector close to the screen lets you easily point out details without casting shadows or being dazzled by the bright projector beam. For larger or more conventional rooms, you'll appreciate their powerful ability to project a bright image from a distance.